Home » Yoga Blog » How can Dru Yoga benefit me? The beginning of the year is always a busy time for us at Inside Out. 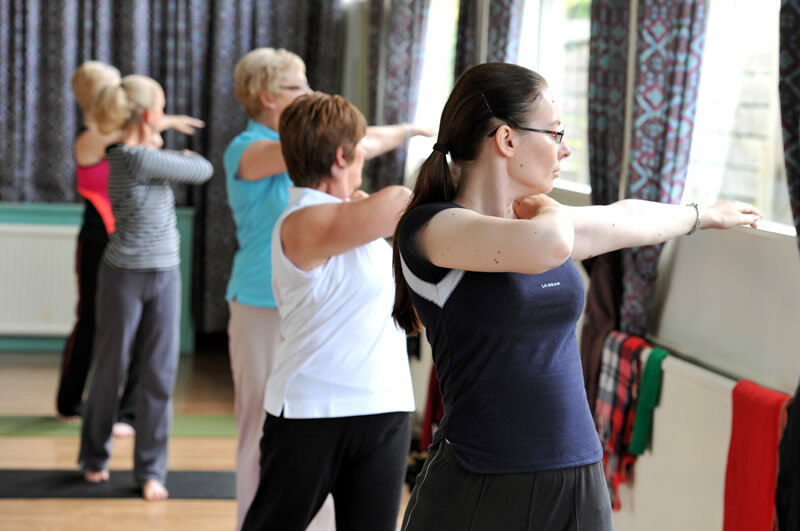 Following the excesses of Christmas many people look to yoga to help them embrace a healthier lifestyle, we get a lot of enquiries and new students coming to classes. One of the most frequent questions we get asked (after “Do I have to get my legs round the back of my head?” answer “Definitely not!”), is “Why should I do Dru Yoga and can it help me?”. So I thought I would take this opportunity to tell you a little bit about Dru Yoga and some of the theory behind the practise. Dru Yoga is a style of Hatha Yoga. In this context Hatha means physical, under the umbrella of Hatha yoga you get all sorts of styles and traditions, such as Iyengar, Ashtanga, Sivananda, Satyananda, Dru and many more. Whilst there are similarities between the different traditions, each one has its own unique way of interpreting the yoga practises and areas of focus. “Dru” comes from the Sanskrit word meaning “still point”. A still point when all around is in a state of flux. The calm in the eye of a storm. Dru yoga gives us the practical tools needed to help us keep our calm, our centre of balance, our still point, regardless of what life throws at us. Dru truly is the perfect antidote to modern life! As a natural sceptic myself, I am constantly putting my yoga to the test. Whatever my problem, I take time to find my still point and trust my inner wisdom, and I can honestly say it never lets me down, the answer always appears, which is why I am so passionate about sharing my yoga knowledge and experience. So, what can you expect from a Dru Yoga class? We always start our Dru Yoga sessions with some fun and lively activations. These help us to get the body moving and get the energy flowing, particularly important if you’ve been sat down all day. These movements also start the relaxation response by helping us to burn off stress hormones. One of the unique features of Dru Yoga is our Energy Block Release (EBR) sequences. Our body requires a constant supply of energy (prana, chi, qi), flowing freely, in order to function well. This energy can become trapped, however, so Dru’s carefully designed EBR sequences help to release tension and free blocked energy, which can then be used for healing, rejuvenation and empowerment, bringing us back to a place of balance and harmony. We also work with classical yoga postures and sequences, all with our added Dru focus, finding that “still point” within the movement. We ensure that the body is aligned within postures, so the muscles are stretched and strengthened correctly, energy can then flow freely without being wasted. We also focus on the beautiful wave like movement of the breath within the body, bringing strength and flexibility to the mind, body and soul. Dru Yoga works on so much more than the physical body. The breath is key to yoga (and life!) and in Dru we spend time checking in with our breath, feeling the expansion and contraction of the breath, tuning in with the energy of the universe. This naturally brings calm and clarity. Dru Yoga sessions always end with some quiet time. That could include meditation and / or pranayama (specific breathing techniques) and relaxation. With an estimated 80% of all illness being stress related, what better gift can you offer yourself than learning to relax? I hope this blog has given you a taste of Dru yoga, if you would like to know more do take a look at our website or visit and like our page at www.facebook.com/insideoutdruyoga and if you already go to a Dru Yoga class please do tell us about how you’ve benefited.